I love seasonal treats! There’s something so fun about having a theme to work with and creating a treat that pulls everything together. 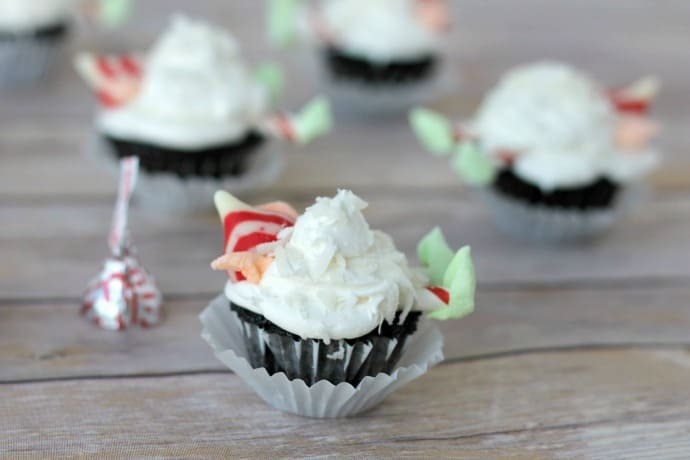 Right now, my Snowball Elf Cupcakes are in stores on the back of every bag of Hershey’s Candy Cane Kisses. I had so much fun making those last year, I wanted to create something similar for Thanksgiving. 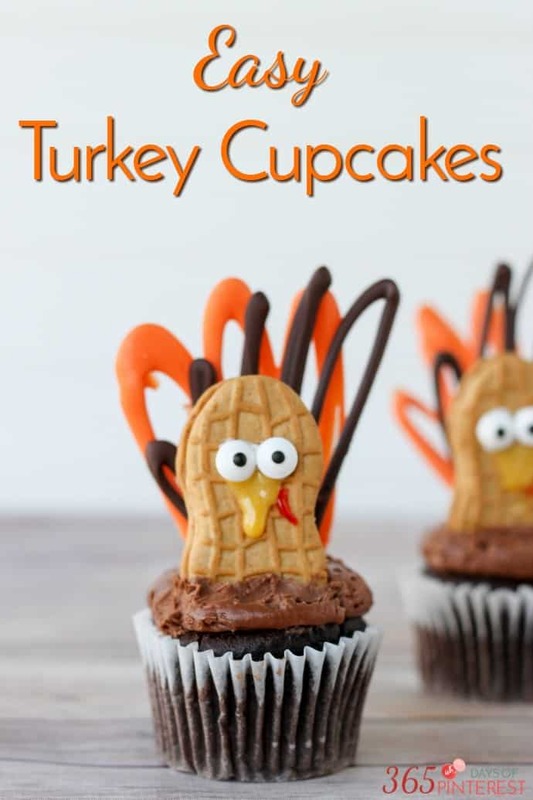 Obviously, my mind went to turkeys, so I played around with a few ideas and came up with these Turkey Cupcakes! I wanted to use something more dramatic and different than candy corn for the turkey feathers. 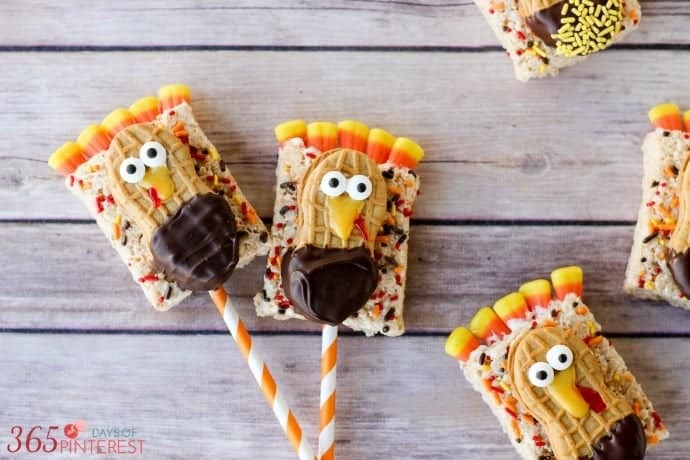 I came up with the idea of using candy melts to make feathers after seeing some beautiful fall leaves made from melting candy. 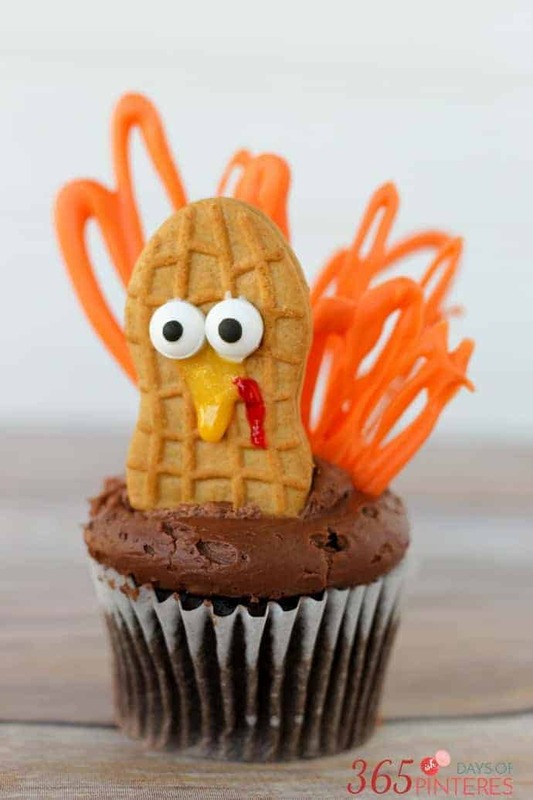 Since the turkey cupcakes are pretty whimsical, I knew they didn’t need to be perfect. It was actually quite easy to make them! 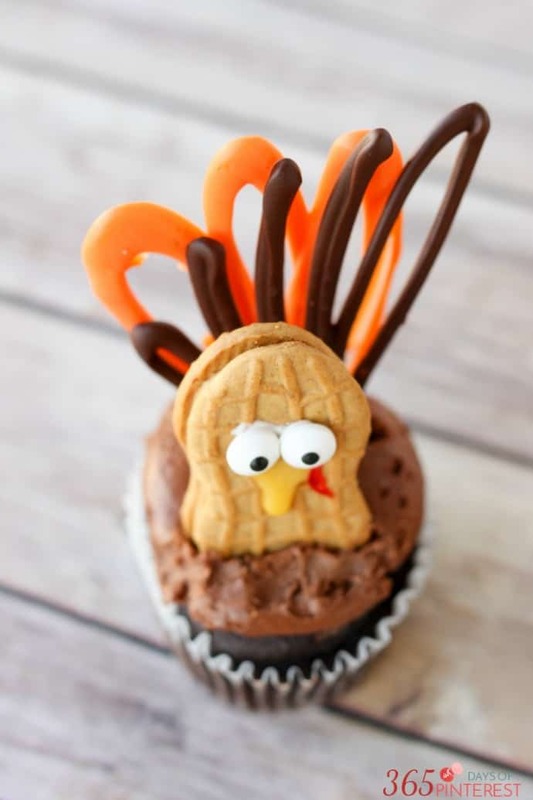 To make the turkey bodies and faces, simply attach candy eyes with a dab of frosting and then pipe on a beak and waddle with the decorating gel. Set aside until ready to assemble the cupcakes. For the feathers, melt the candy melts according to the package directions and then place in a piping bag or a plastic baggie and snip off the end. Pipe the melted candy onto a sheet pan lined with wax paper. Use a sweeping motion to create loops and lines of candy that meet at the bottom. (I’m sorry I didn’t take photos of this process- but you get the idea by looking at the feathers, right?) 🙂 Place the sheet in the refrigerator to set quickly. After they are set, gently remove from the wax paper with a spatula. 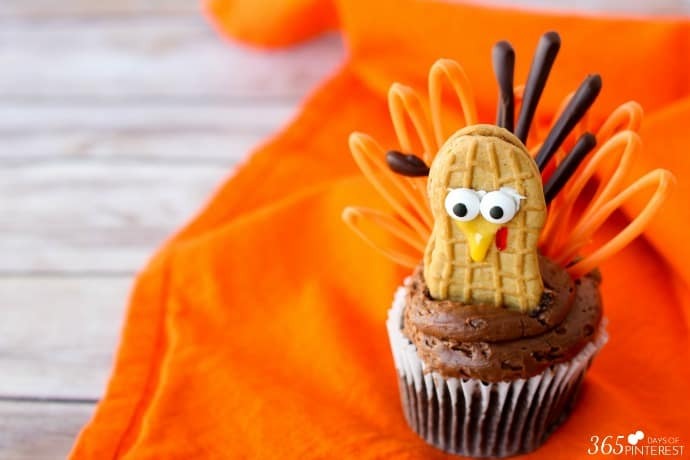 Press the turkey body down into the frosting of a cupcake, and then gently place two or three tail feathers behind it. Every turkey will be unique and adorable! 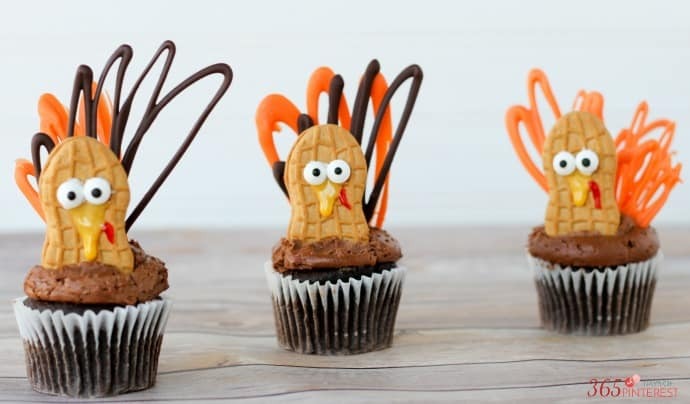 NOTE: be sure to use candy melts and not plain chocolate or vanilla chips to make the feathers. The candy melts hold their shape well and won’t get soft at room temperature. So cute! Glad you chose the cupcakes!! I found this when looking at a friend’s Pinterest and YAY it was YOURS. They are absolutely adorable.